‘Safe, attractive and enjoyable streets’ is our motto. Look at a photo of a London street a hundred years ago, and you see people, cyclists, occasional horse-drawn carts – and lots of peaceful space. Look today, and the picture is dominated by petrol and diesel-driven vehicles, noise, vibration, filthy air – and little or no room for the rest of us. Wandsworth has five main town centres. They are the vibrant hearts of where we can shop locally; spend time in our local coffee shops, restaurants, pubs, and wine-bars; and get to our libraries, health centres etc. 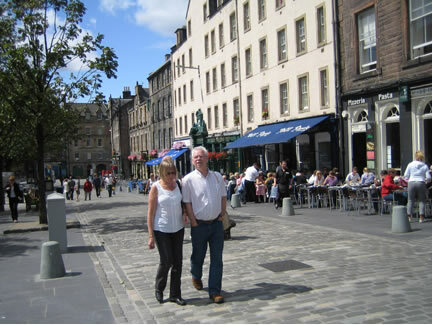 One way or another, we need to find our way back to people-friendly town centres. Innovative urban designers like Colin Davis and Jan Gehl have come up with a host of imaginative ideas for re-balancing and re-designing our town centres. Cities like Lyons, Copenhagen, Barcelona and Melbourne have transformed themselves in recent years. But all these ideas need to suit local circumstances. And who best to think about what’s needed in Clapham Junction, Putney, Balham, Tooting, or Wandsworth than us local residents? It also requires Councillors and Officers who are understand the issues involved and who are aware of the new thinking. Very helpful in this regard is the highly illustrated and detailed Manual for Streets 2 (published in late 2010 by the Chartered Institution for Highways and Transportation). We in Wandsworth Living Streets have a huge opportunity to take this process of public education forward, and to come up with practical proposals that will make a difference to how enjoyable our town centres could be for people to spend time in. As a start, this WLS campaign is preparing a couple of site inspections. One will visit a street in London, like the Cut near Waterloo, where the local Councils have already transformed the urban environment. The other will visit one of our own town centres in Wandsworth, perhaps Putney High Street, with an eye to what is wrong, and how we could do things differently. Jan Gehl—World-renowned Danish architect who has changed cities in many parts of the world. See his talk, Creating Tomorrow’s Liveable Cities, given recently (19 January 2011) in London (website here). Colin Davis — Ideas on design and management of the public realm — Leading British consultant who speaks engagingly and authoritatively on how to improve our streets. Michael O’Hare — Cities for People – Thoughtful American architect and engineer with exciting ideas for reinventing the city. Ben Hamilton-Baillie: Another urban designer with innovative ideas for reconciling traffic movement with quality public spaces in towns and cities. Manual for Streets – Published in 2007, this path-breaking guide to residential street design emphasises that streets should be places in which people want to live and spend time in, and are not just transport corridors. In particular, it aims to reduce the impact of vehicles on residential streets by asking practitioners to plan street design intelligently and proactively, and gives a high priority to the needs of pedestrians, cyclists and users of public transport. Manual for Streets 2 – Published in 2010, this companion guide takes the new thinking beyond residential streets and shows how other roads and highways can be planned and improved to deliver more contextually sensitive designs. You post very interesting content here. Your page deserves much more visitors.